Are You Convinced Yet! 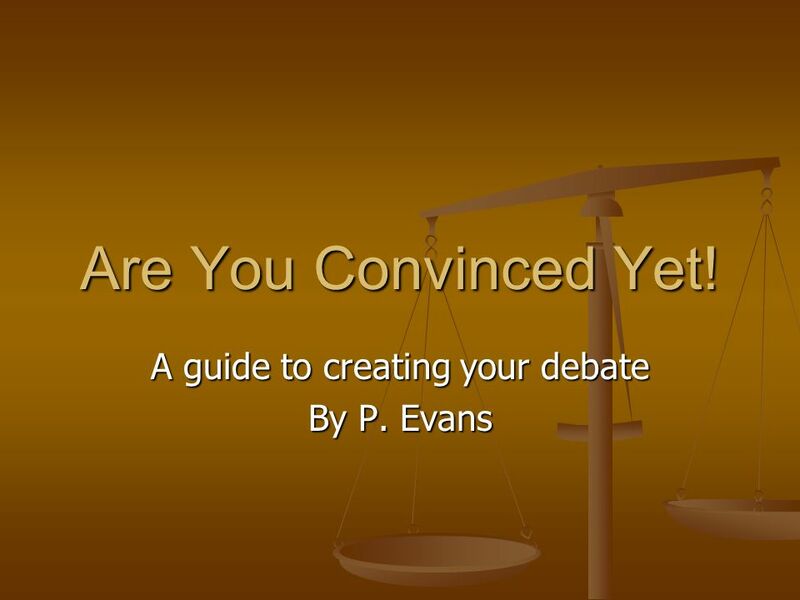 A guide to creating your debate By P. Evans. 2 What is Debate? Debate is a game in which two opposing teams make arguments in support of their views and disagree with the views of the other team. Debate is a game in which two opposing teams make arguments in support of their views and disagree with the views of the other team. Debate is a great tool for learning analytical thinking skills and for forcing self conscious reflection on the validity of ones ideas (Nisbett, 2003). 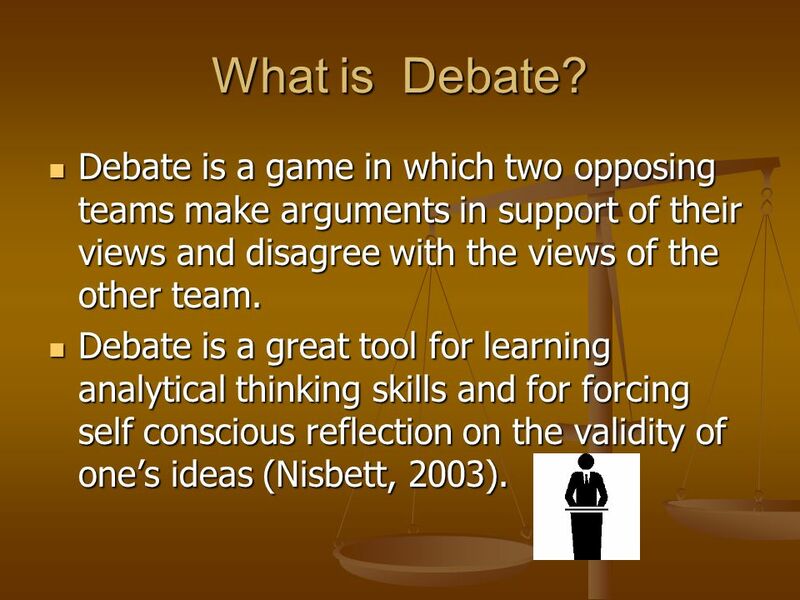 Debate is a great tool for learning analytical thinking skills and for forcing self conscious reflection on the validity of ones ideas (Nisbett, 2003). 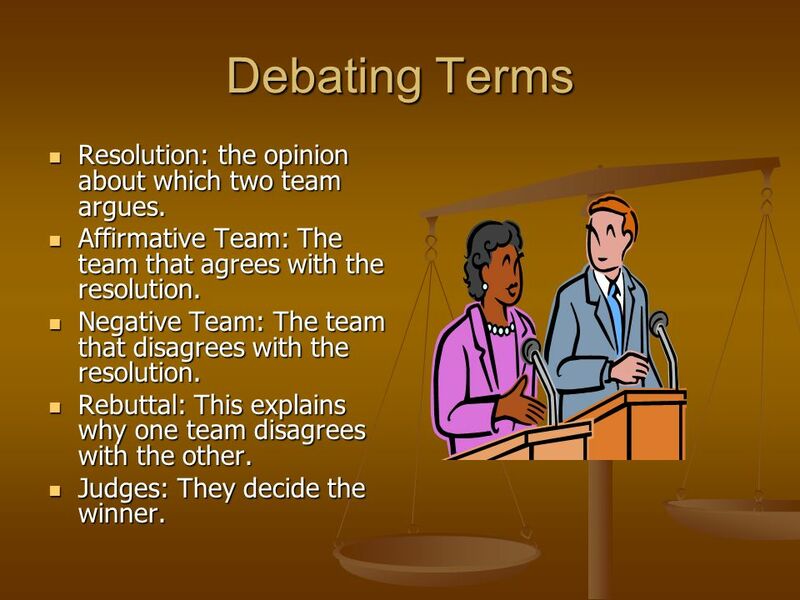 3 Debating Terms Resolution: the opinion about which two team argues. Resolution: the opinion about which two team argues. Affirmative Team: The team that agrees with the resolution. Affirmative Team: The team that agrees with the resolution. Negative Team: The team that disagrees with the resolution. Negative Team: The team that disagrees with the resolution. Rebuttal: This explains why one team disagrees with the other. Rebuttal: This explains why one team disagrees with the other. Judges: They decide the winner. Judges: They decide the winner. 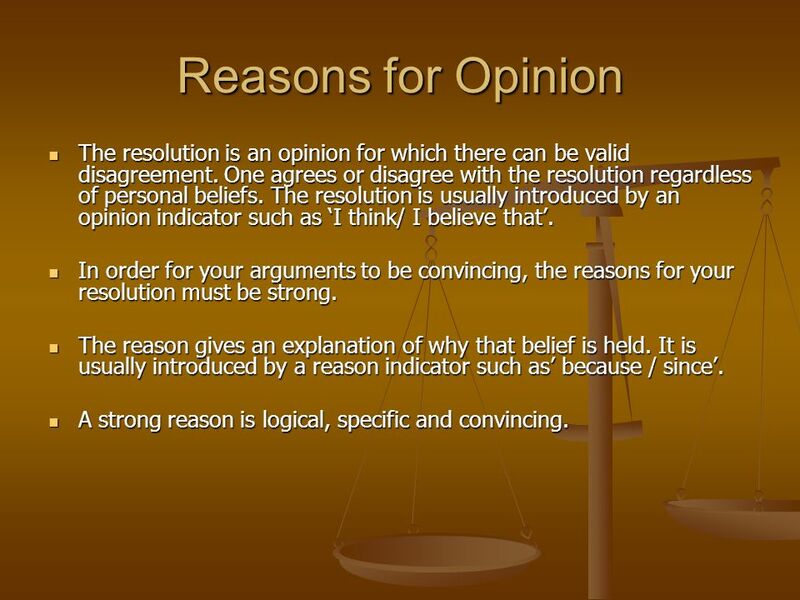 4 Reasons for Opinion The resolution is an opinion for which there can be valid disagreement. One agrees or disagree with the resolution regardless of personal beliefs. The resolution is usually introduced by an opinion indicator such as I think/ I believe that. The resolution is an opinion for which there can be valid disagreement. One agrees or disagree with the resolution regardless of personal beliefs. The resolution is usually introduced by an opinion indicator such as I think/ I believe that. In order for your arguments to be convincing, the reasons for your resolution must be strong. In order for your arguments to be convincing, the reasons for your resolution must be strong. The reason gives an explanation of why that belief is held. It is usually introduced by a reason indicator such as because / since. The reason gives an explanation of why that belief is held. It is usually introduced by a reason indicator such as because / since. A strong reason is logical, specific and convincing. A strong reason is logical, specific and convincing. 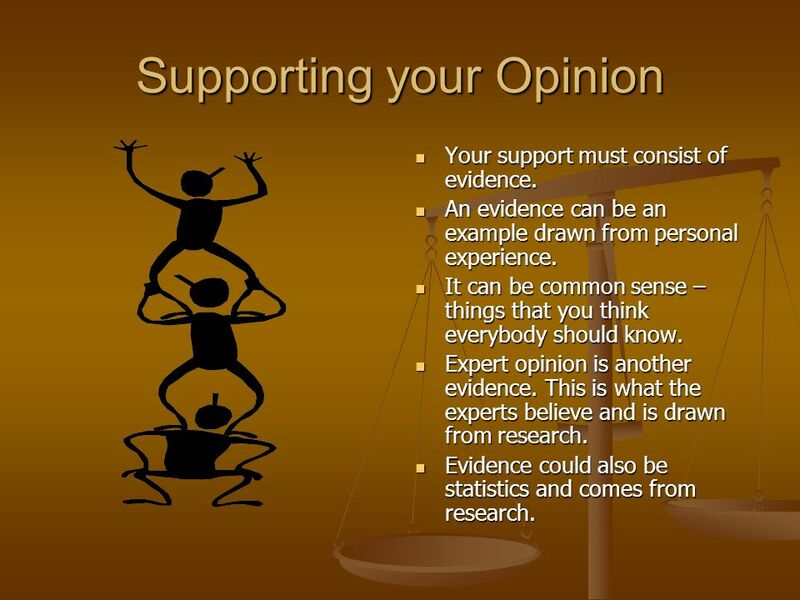 5 Supporting your Opinion Your support must consist of evidence. An evidence can be an example drawn from personal experience. It can be common sense – things that you think everybody should know. Expert opinion is another evidence. This is what the experts believe and is drawn from research. Evidence could also be statistics and comes from research. 6 Predicting and Refuting The Opponents Argument. Refuting your opponents argument is an important part of a debate. Refuting your opponents argument is an important part of a debate. Brainstorming for strong arguments your opponents may use will help you prepare a good rebuttal. Brainstorming for strong arguments your opponents may use will help you prepare a good rebuttal. Taking notes during your opponents arguments helps you to be clear about what they are arguing. Taking notes during your opponents arguments helps you to be clear about what they are arguing. 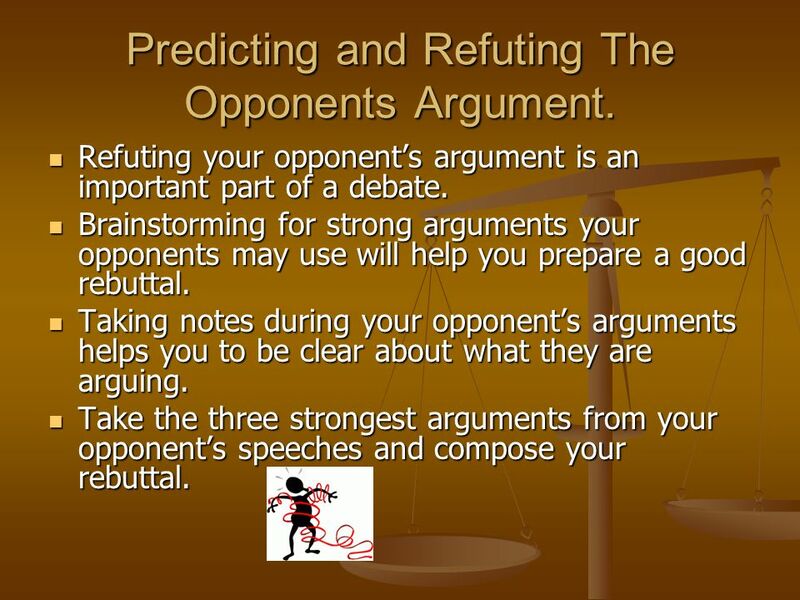 Take the three strongest arguments from your opponents speeches and compose your rebuttal. Take the three strongest arguments from your opponents speeches and compose your rebuttal. 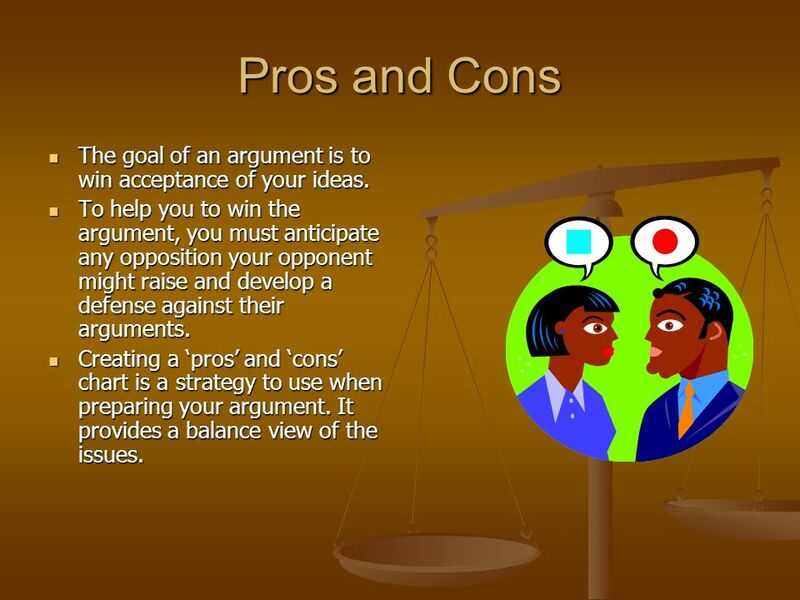 7 Pros and Cons The goal of an argument is to win acceptance of your ideas. The goal of an argument is to win acceptance of your ideas. To help you to win the argument, you must anticipate any opposition your opponent might raise and develop a defense against their arguments. To help you to win the argument, you must anticipate any opposition your opponent might raise and develop a defense against their arguments. Creating a pros and cons chart is a strategy to use when preparing your argument. It provides a balance view of the issues. Creating a pros and cons chart is a strategy to use when preparing your argument. It provides a balance view of the issues. 8 Debating Format First speaker from affirmative team introduce the topic and state the first argument. First speaker from affirmative team introduce the topic and state the first argument. The first speaker from the negative team state the first argument. The first speaker from the negative team state the first argument. The second speaker from the affirmative team state the second argument. The second speaker from the affirmative team state the second argument. The second speaker from the negative team state their second argument. The second speaker from the negative team state their second argument. Provide time for each team to prepare their rebuttal. Provide time for each team to prepare their rebuttal. The negative team gives two rebuttals for the affirmative team two arguments and then summarizes their own two reasons. The negative team gives two rebuttals for the affirmative team two arguments and then summarizes their own two reasons. 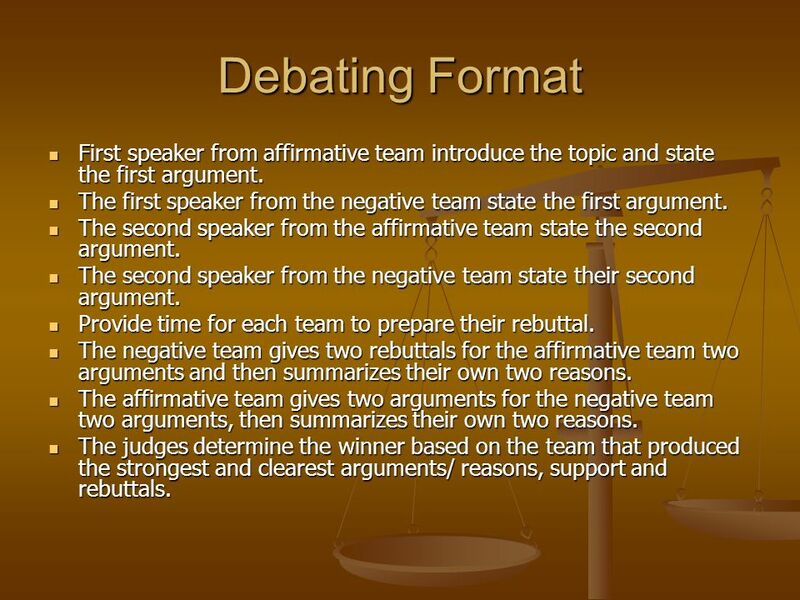 The affirmative team gives two arguments for the negative team two arguments, then summarizes their own two reasons. The affirmative team gives two arguments for the negative team two arguments, then summarizes their own two reasons. The judges determine the winner based on the team that produced the strongest and clearest arguments/ reasons, support and rebuttals. The judges determine the winner based on the team that produced the strongest and clearest arguments/ reasons, support and rebuttals. Download ppt "Are You Convinced Yet! A guide to creating your debate By P. Evans." The Vision Socrates believed that enabling students to think for themselves was more important than filling their heads with right answers. Public Forum Debate Um, debating in a public forum? General Understanding of Debating.  Organized public argument on a specific topic. With one side arguing in favor and the other team opposing the issue. S2 – DISCURSIVE WRITING Aim: To persuade/convince the reader that your are right in your views. Writing Effective Arguments What is a written argument? What is a reasonable tone in an argument? What part does audience play in my argument? How do I. Introduction To Debate and Building an Effective Argument. Lincoln-Douglas Debate An Examination of Values. OBJECTIVES: The student will 1. Demonstrate understanding of the concepts that underlie Lincoln-Douglas. Judge’s Briefing Here!. So you want* to become a Debate Judge? *were forced by your kid. Parts of a Debate. Opening Statements Organization It must have an intro, body, and conclusion Try to think of a slogan to tie everything together Argument. Using Debates in English Lessons A Communicative Approach. Part 3 – REFUTING OPPOSING ARGUMENTS.  Before you start writing an argumentative essay, I strongly suggest you to prepare an outline and first, write. Class debates LA listening and speaking outcomes. The Great Debate! What it is and How to do it!. BASIC TERMS! Debate: a game/discussion in which two opposing teams make speeches to support their arguments. Researching for a Debate. What is a debate? A debate is an argument. But rather than being a shouting match between two sides, a debate has strict rules. What Is Debate? Components and Process of a Debate. Argument Writing Standard: 9-10.WS.1. Write arguments to support claims in an analysis of substantive topics or texts, using valid reasoning and relevant.